StartsNow is an app for Android and iOS that helps you find things to do, right now. Long ago, in this very land, people did a crazy thing called “making plans.” These “plans” were agreed upon betwixt friends, family, and coworkers alike. Logistics were discussed, meeting spots and times agreed upon, and people generally showed up on time. Flaking was considered to be the utmost in rudeness, because, after so much “planning,” it was hard to make a new plan. And then came the cellphone, changing everything. These days, flaking is not only common but also pretty socially acceptable. Planning seems to have gone the way of the rotary phone. If you send out an invite more than a week in advance, pretty much count on everyone forgetting about your party. That’s way too far ahead to plan. Instead, turn to StartsNow, which is a very modern way of figuring out what you want to do, right now. 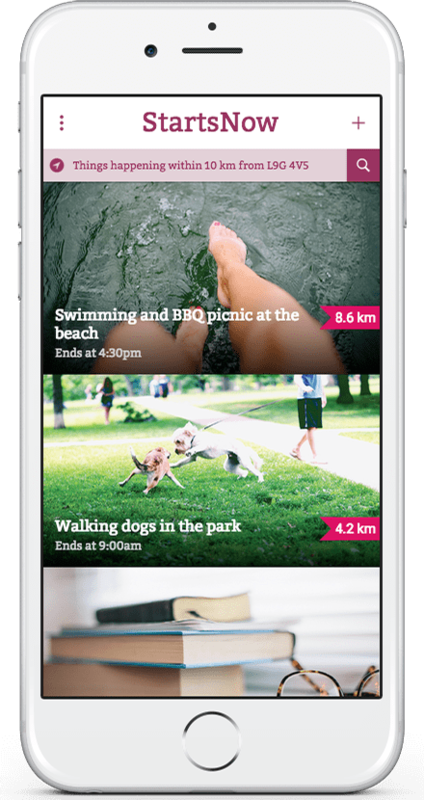 The app lets people broadcast what they’re doing or cool events in their area so that friends can join along. There’s no planning, few logistics, and just people who want to do cool stuff – when you want to do it. The app is currently in beta, but you can head over to their site and sign up to be one of the first to hop on. If you’re one of those people who says, “Let’s touch base tomorrow!” instead of making plans for tomorrow, today, and you know that planning is for the olden days, this app is probably for you. Get with the times and live spontaneously with StartsNow. You know you want to find something cool to do this afternoon.